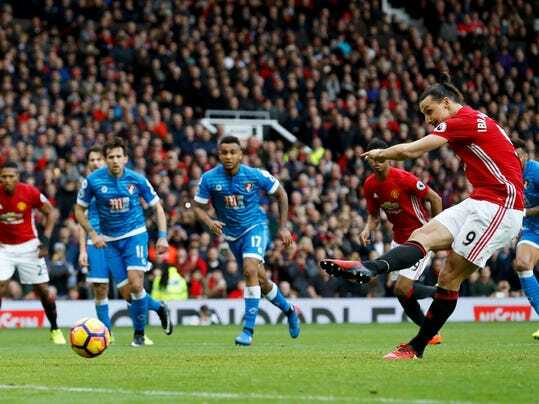 Manchester United striker Zlatan Ibrahimovic had a penalty saved and was fortunate to avoid a red card in an incident-filled 1-1 draw against 10-man Bournemouth on Saturday, the latest Premier League setback at Old Trafford for Jose Mourinho’s team. A week after winning the League Cup for United with a double against Southampton at Wembley Stadium, Ibrahimovic endured a frustrating return to league action by seeing his 72nd-minute penalty clawed away by Artur Boruc. FAQ: What was the tipping point for Adam Silver's memo to NBA owners? Sports of The Times: The I.O.C. Finally Stops Tiptoeing. And Russia Pays the Price.